Thread: New to the hobby and already having problems. Hello all , I believe this is the part of the forum where I also ask for help? Maybe have a beer or coffee while reading, this is a in depth topic. So... I was given this 60 gal. 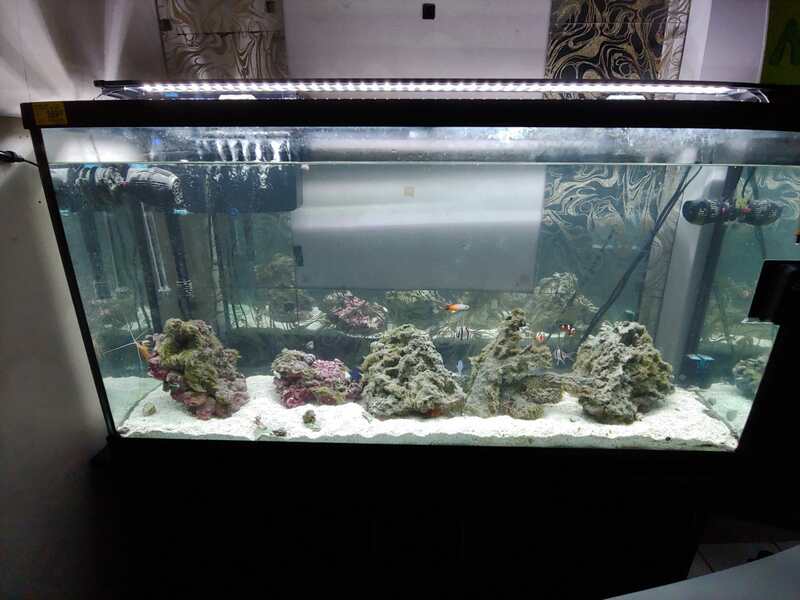 saltwater aquarium from a friend because he can no longer spare time maintain the tank. - Kept existing water, live rock, and sand. - Came with a aquarium water filter that was double in length than you typical one. It had 3 stages from bottom (sponge), rocks, and the top 2 carbon filters side by side. - 1 big power head (produce water waves) and 1 small power head on the opposite side. - Replaced Finnex 24/7 planted led aquairum light with 1 mars aquamax led and vipar spectra led. Blues are at 70% intensity and whites are 25% intensity. Blue comes on first followed by white, then white comes off, and lastly the blues. 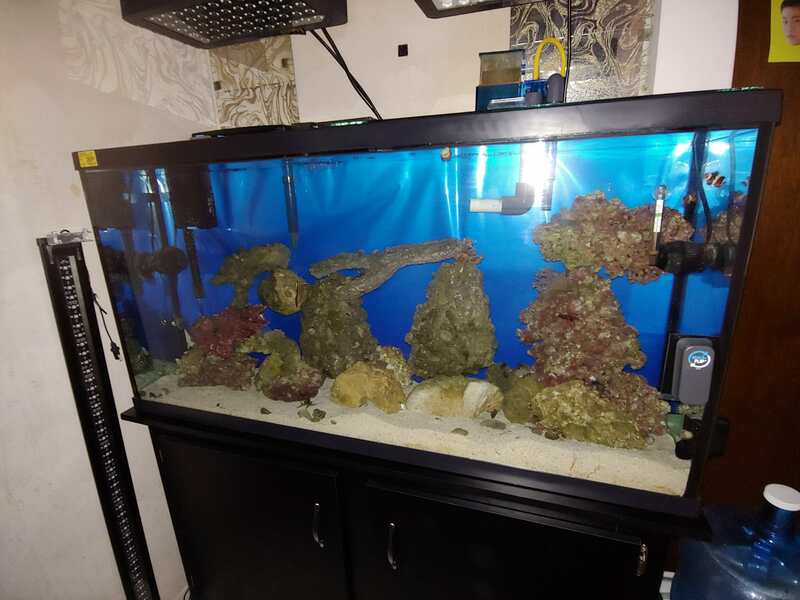 - Added an additional water filter (removed filter elements because sd coral says saltwater aquariums does not really need to be filtered since I have lived rock). - Removed the filters off the other aquarium water filter because of the same reason above. - Same power wave heads. - Aqua Max HOB 1.5 protein skimmer. Current live stock besides the rocks and algae. When moved to my home. - Did 2 water changes within the week (5 gal. 1 day and another 5 gal. 3 days later) while siphoning from the top surface of the sand and the surface of the live rock wherever I saw algae (could not siphon all algae off the rocks). NITRATE levels were max on the API 5 in 1 test strips. Nitride was on the lower end. Bought a Aquamax HOB 1.5 hang on the side protein skimmer. - Week 2, 10 gal. sand surface water change. Bought more snails and hermit crabs thinking they would help lower the nitrate. Also bought an Aqua flow 70 aquarium water filter with the thought of filtering more NITRATES out (which did not seem to help). Added more live rock. - Week 4, 20 gal. top water surface change (friend said most of the dirty water floats on the surface of the water and not on the bottom. Installed two aquarium led lights (mars aqua max and vipar spectra) for algae reduction and coral growth. Bought more live rock to help reduce nitrates and 10 more Nassarius Snails and a starfish. NITRATE LEVELS ARE STILL HIGH -_-. The corals that came with the live rock are doing okay somehow (must be because of the lighting). Phosphate reading of 0.5 as of last night after more live rock was introduced. Nitrate reading of 80-160 as of last night after more live rock was introduced. Last edited by Cloud777x; 10-05-2018 at 10:08 AM. 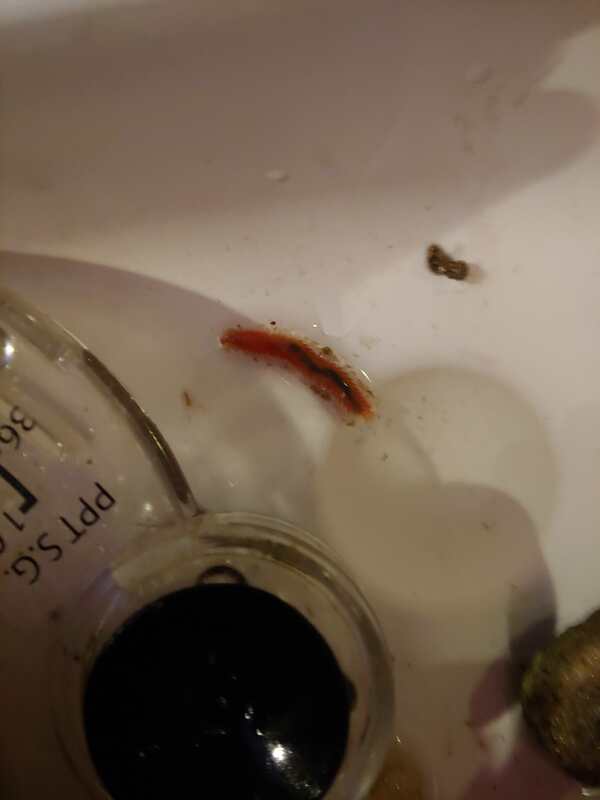 What is this worm and is it aquarium safe or is it a pest? Thanks brandon for the reply. The last water was 20 gal. and it did not lower the nitrates by much. what is this? and is it beneficial to the aquarium? i am near the lemon grove area of san diego. after a water change how long do you wait till you can test the water o_O? Test nitrates right before the water change. Do the water change and give it a few minutes to circulate than repeat the test. You should see a change. If nitrates rise back up quickly, within a day or two, your tank might be going through a mini cycle due to the move. Are you able to test ammonia? I also have a salifert ammonia test kit I'm not using that you're welcome to have. I recently dealt with a bad nitrate spike, check your water as Brandon mentions above, before you even mix the water to salt, my ro system was done and that was a small issue that replaced but a good skimmer upgrade solved the rest of my spiking nitrates. 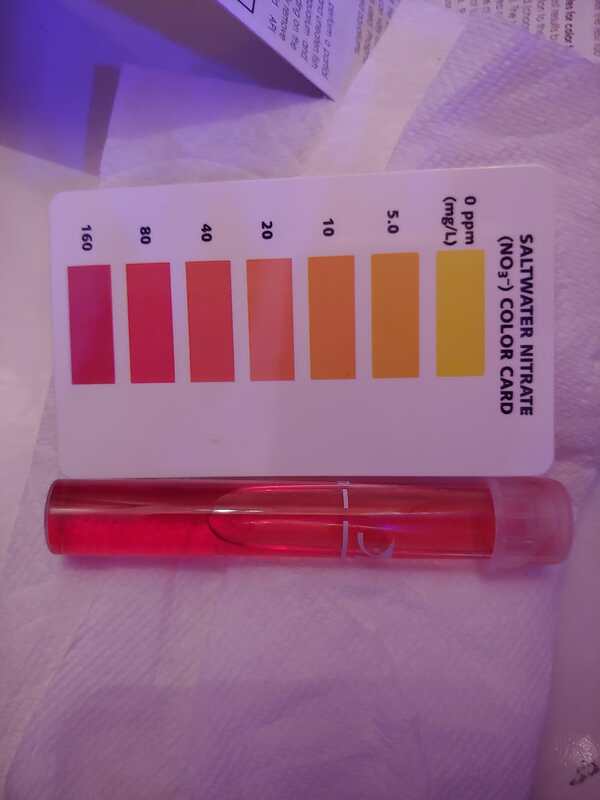 I am wondering about our water quality as it came on suddenly in my tank. 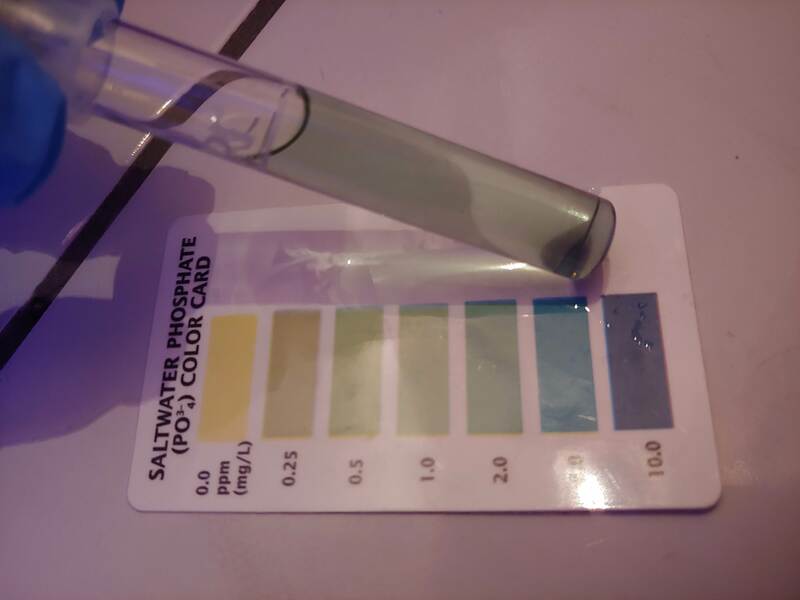 My water changes were not solving the issue either because my skimmer was inadequate or the RO water was not completely clean before my mix as my nitrates continued to climb and bleach corals. BTW they bleach faster than they re-color! What I had to do to lower my nitrates/phosphates was a weekly water change of 5 gallon and light feedings every other day. I used to feed twice a day and also feed my corals twice a week. My levels have been cut in half since I’ve done that. Still going down week by week. Your skimmer looks a little too wet for my liking, maybe fine tune that a bit. Remove all pests as u see them so the problem doesn’t get out of hand. Also, try and introduce some more copepods/amphipods. I should have asked, how are you mixing your water? Are you using rodi? Are you topping off evaporated water with rodi? @brandon, its been about a month... possibly still going through a mini cycle? Guy in SD Coral says I do not have to worry about ammonia because my fish has not died on me (except for 1 but I blame the heat in the aquarium 84deg. ). I am using rodi water from aquarium warehouse and mixing with instant ocean reef crystal sea salt. Salinity ranges from 1.023 - 1.026. Water has not evaporated to the point where I need to add more water yet. Maybe it is because I am doing frequent water changes? @knight, so did you solve your nitrate problem yet? my skimmer seems to be doing okay because I am getting crap in the collection cup. @joey, i've been feeding the fishes once daily. maybe im putting more than I should in the water. I will try 1 every two days then. I will also introduce copepods, thats a great idea since they are also on the mandarin goby's diet list. what kind of pests are you referring to? thank you guys so far for the input. Btw 84 degrees is quite fine. I have 86 numerous times for multiple days with no ill effects. 1. Do a 20% water every 4 days to a week. If you had sensitive corals I would say once a week at max. Soft corals can put up with a lot. If you don’t have a reverse osmosis system to make fresh water, get some jugs and hit up your local fish store for some or go to scripps pier and get free and actual ocean saltwater there (it’s by the surfer shower). If you’re adding salt to R/O water, make sure to allow your new water to aerate for 24 hours with an air pump + bubble stone and match ph & salinity before adding it to reduce stress on your fish. The slower you can add the water to your tank the better. 2. It’s ok to siphon your sand down to the glass if it’s less than 3” deep. You aren’t running a deep sand bed so it’s actually beneficial to get all of the nitrate-causing detritus out and you won’t have to worry about hydrogen sulfide as the sand isn’t deep enough to be anaerobic. 3. You have a pretty heavy bioload in your tank. Even so, I wouldn’t feed more than two cubes of frozen mysis or brine shrimp to the tank PER DAY and even that seems like it might be a lot for your setup. Overfeeding is the #1 cause of excessive nitrates. 4. Get a bottle of nitrifying bacteria like Seachem’s Stability or similar and dose according to recommendations. 5. If you’re going to rely on just your rocks to denitrify, you’re going to need at least twice as much as what you have in your tank. 6. A protein skimmer will help but nowhere near as much as people often think it will. Not until you start carbon dosing and that comes with its own set of problems. 7. Ignore all guidelines on how much clean up crew you should have. Even snails poop and that becomes nitrates. What they’re good at is removing algae from spots that you don’t want it or stirring that sand up so your tank flow can flush it into your mechanical filtration for removal. What typically happens is, they do what they’re supposed to do for a few weeks and eventually can’t find any more food, systematically starve one by one, which releases that organic material back into the water column, which turns into nitrates. It’s better to start with just a few snails. They’ll do a better job in the long run than 100. 8. Get rid of the ceramic media in your filter altogether and rinse out those filter sponges several times a week. Wet them thoroughly and tap them on the side of your sink and be amazed at how much crud comes out. Big nitrate source! Those sponges get absolutely disgusting very quickly. Also, keep in mind a mechanical filter will not remove nitrates. 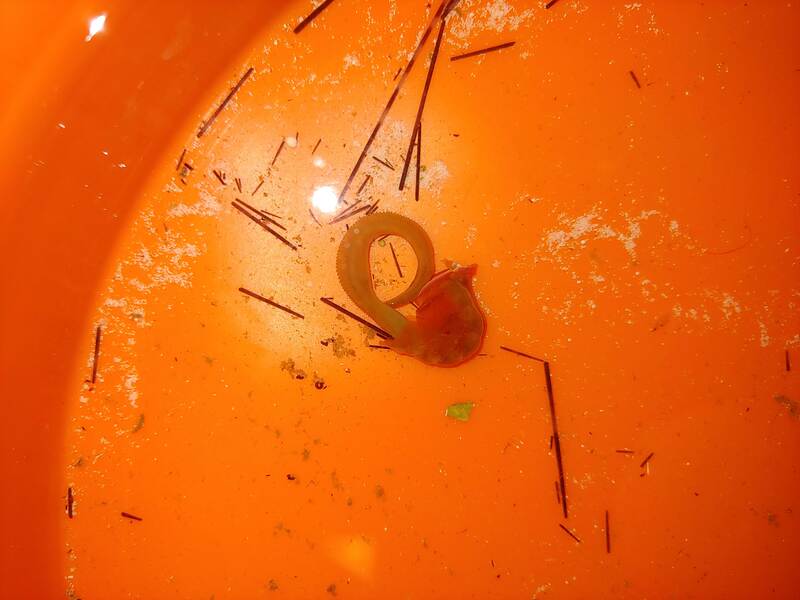 It can only separate the debris floating in the water column that will eventually break down into nitrate. This will happen either in your tank or your filter. Either way that nitrate will still be in your tank. That’s where cleaning out those filter sponges often comes into play. Keeping clean water isn’t about filtering contaminants, it’s exporting them out of your tank in one way or another, whether it’s through basic methods like siphoning your sand and doing a water changes, growing tons of macro algae (moderate) or adding extremely controlled amounts of organic carbon to grow nitrate consuming bacteria which is then removed from the tank through a protein skimmer (advanced). 9. Most of the critters you’ll see in your tank after the lights go out are harmless. The worms pictured are ok.
10. I wouldn’t run anything over 50% blue channel on those boxes. If you get to the point where you want to keep sps corals that need greater intensity then you might consider 75%. I ran a mixed reef for two years on three galaxy hydro boxes (pretty much what you have) with whites = 15% and blues = 45%. I even kept montipora and had no issue getting really good growth with my lights at a similar installed height. IMO you’re overkilling it. Expert tip: If your mandarin isn’t eating a copepod every 5-10 seconds, you don’t have enough in your tank and even a small dragonet will absolutely decimate a pod population within months. Either you can (A) Buy pods to replenish the population or (B) Pipet some frozen brine in front of it and if you’re extremely lucky, it will eat it. The best option if you’re low on pos and if you can find it, is a product called Nutrimar Ova. That stuff will become your best friend until your pod population can be temporarily raised and hopefully permanently by adding a refugium or algae turf scrubber down the road. I have never had a dragonet that wouldn’t eat Nutrimar Ova. Last edited by crustaceon; 11-22-2018 at 07:14 PM.